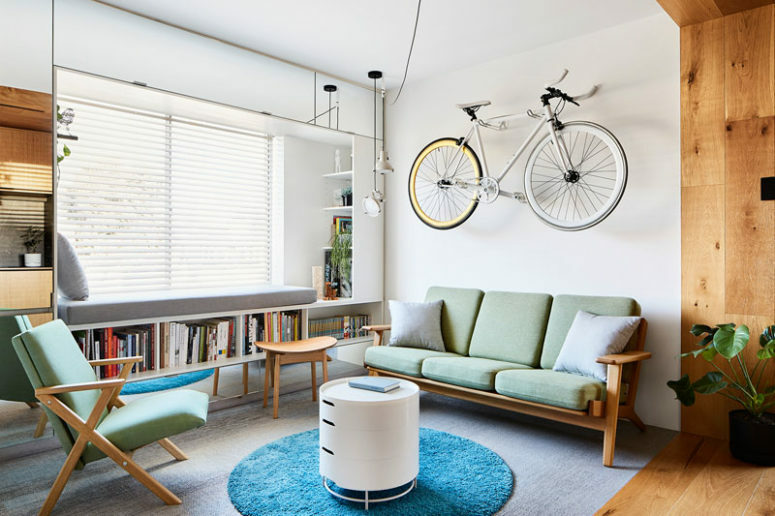 This small apartment in Melbourne, Australia, is a very functional and livable dwelling and shows off many smart solutions integrated by Tsai Design while decorating it. 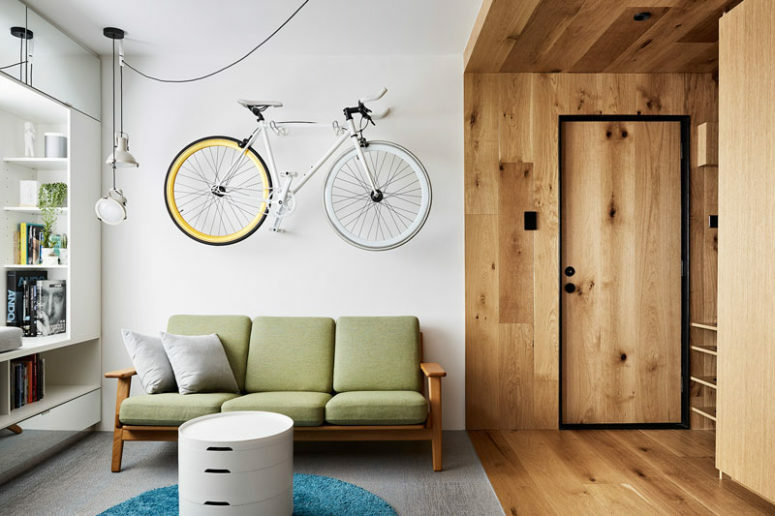 Upon entering the small apartment, there’s a custom designed wall unit that features a flexible pegboard wall, creating a place to hang jackets, keep umbrellas and store shoes. The entryway opens up to the living room, where there’s a window seat surrounded by shelving and cabinetry. 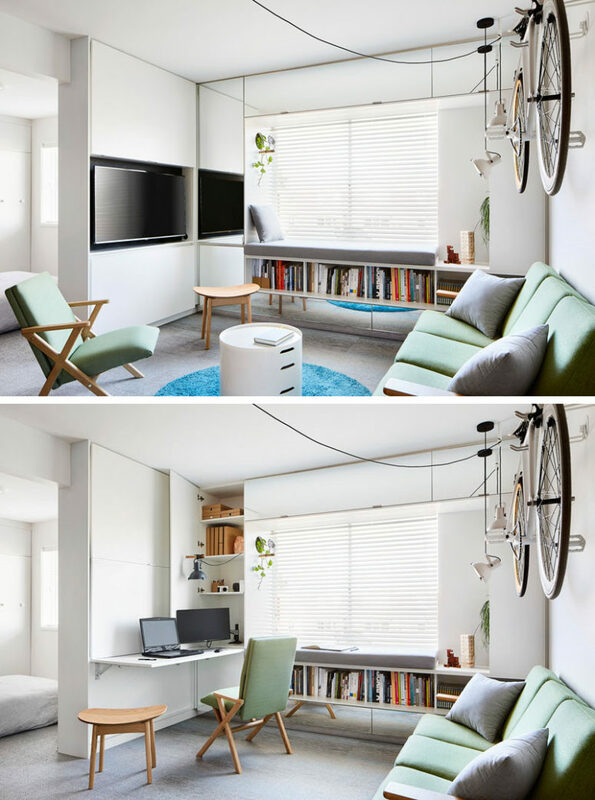 The living room also doubles as a home office, with the desk and computers hidden behind cabinet doors when not in use. 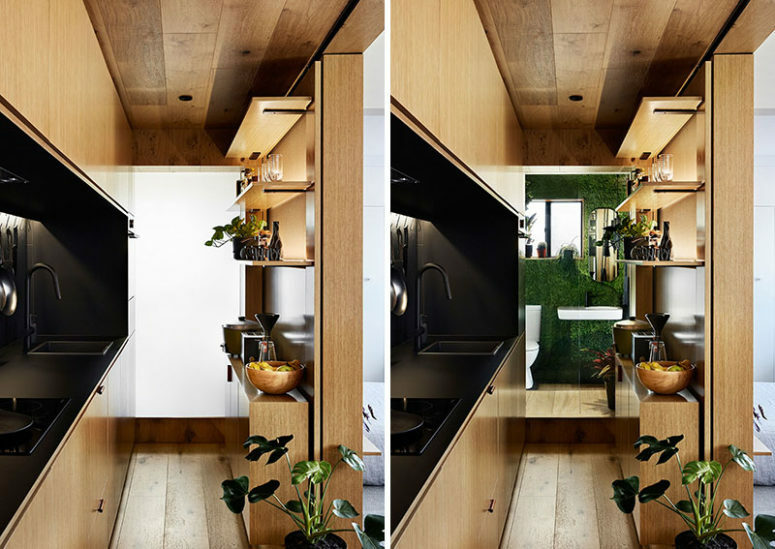 The kitchen, clad with wood, is 13 feet long, with the fridge and a washing machine hidden within the kitchen cupboards. 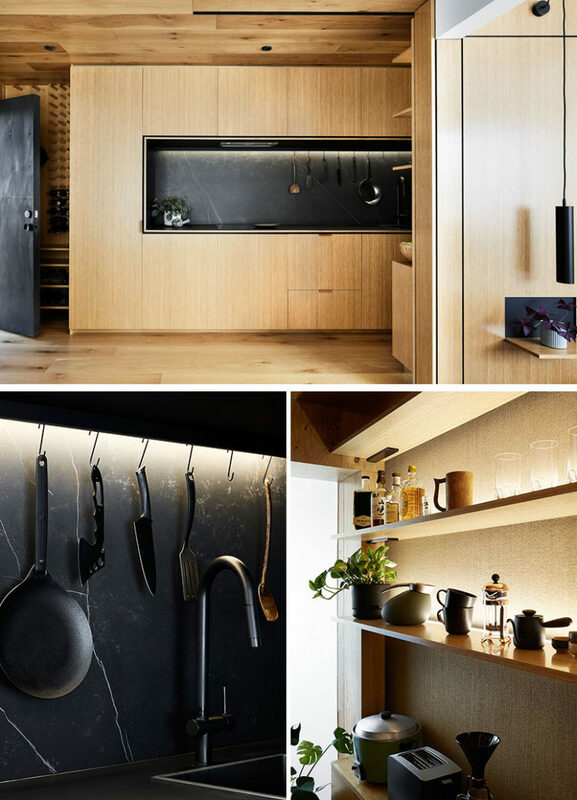 Black has been used to contrast the light shade of the wood. A narrow cavity between the kitchen shelves and the wall hides the dining table. It slides out via a sliding door mechanism, and the table then folds down, creating a light floating effect to the table top. The dining chairs are also fold away, minimizing space waste from furniture. 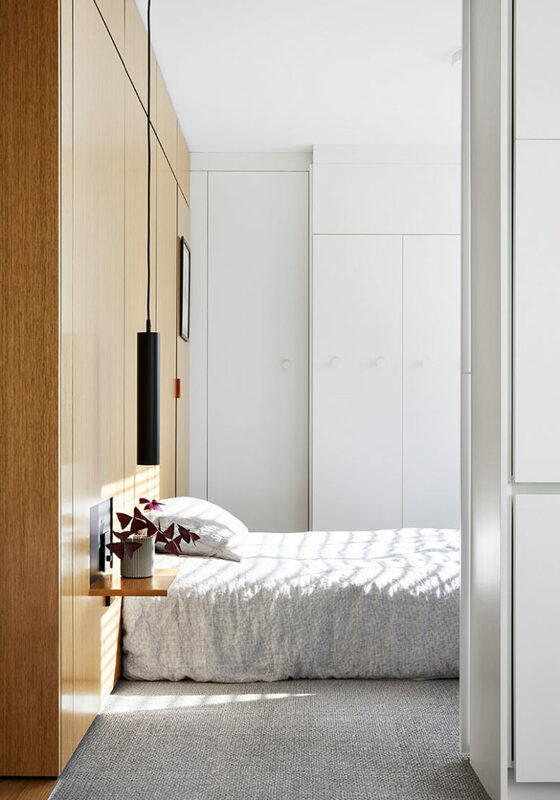 The wood that’s featured in the kitchen, also forms the headboard, with a small cut-out revealing a small wall panel that folds down to form the bedside table. 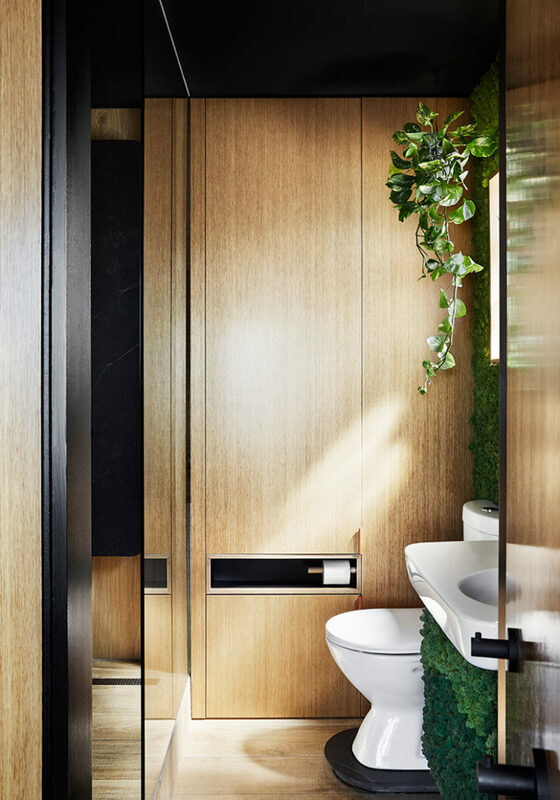 At the end of the wall panel is a concealed door that leads to the bathroom, with only the leather door pull to indicate something more beyond. The timber look is even continued to the bathroom, with timber texture porcelain tiles covering the floor and walls. A green wall, that can be seen from the kitchen, creates an outdoor environment. 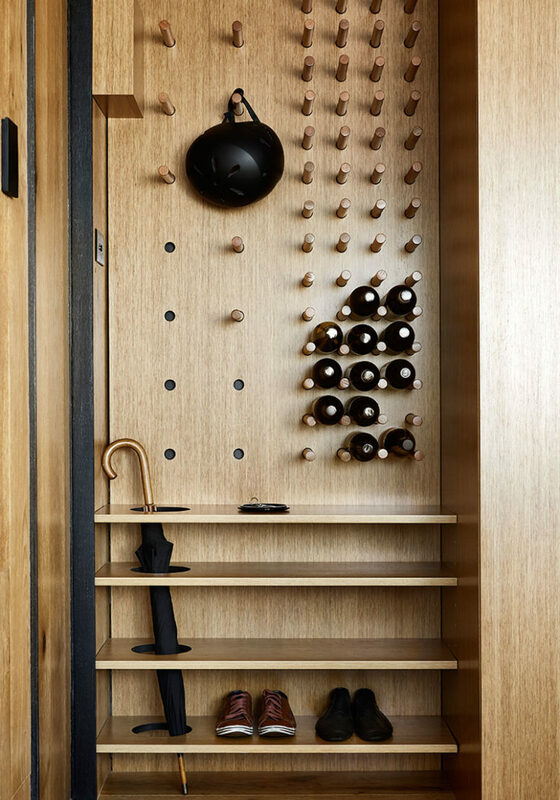 A fold-out clothes drying line is hidden away from view within the wooden wall. 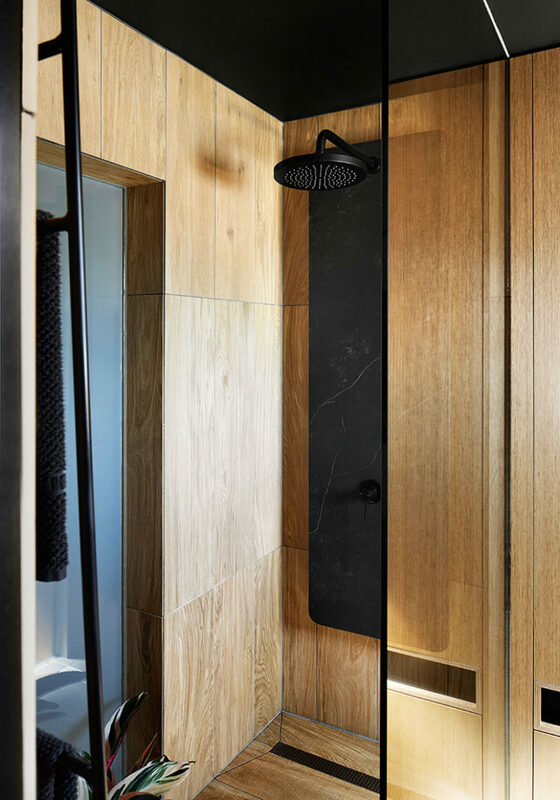 A glass shower wall separates the shower from the rest of the bathroom, while the frosted window between the bathroom and the kitchen can also be seen.